Hall of Fame broadcaster Jerry Coleman, who was an infielder for the New York Yankees for nine seasons and a decorated veteran of World War II and the Korean War, passed away Sunday in San Diego. He was 89. Coleman worked as a broadcaster for the San Diego Padres since 1972, pausing in 1980 to take over the reins of the team for a season, posting a record of 73-89. He returned to the booth where a generation of fans fell in love with him for his work on the microphone. The Baseball Hall of Fame bestowed him with the prestigious Ford Frick Award in 2005. The Padres released the following statement regarding his death. "The San Diego Padres are deeply saddened by the news today of the passing of Jerry Coleman. We send our heartfelt sympathy to the entire Coleman family, including his wife, Maggie, his children and grandchildren. On behalf of Padres' fans everywhere, we mourn the loss of a Marine who was truly an American hero as well as a great man, a great friend and a great Padre." Fans of the Yankees associate number 42 with the great Mariano Rivera who just retired at the end of the 2013 season; however, Coleman sported the legendary number during his entire tenure with the team. He earned a spot on the 1950 All-Star team and was later that season named the recipient of the Babe Ruth Award by the BBWAA of New York for his performance in the World Series. 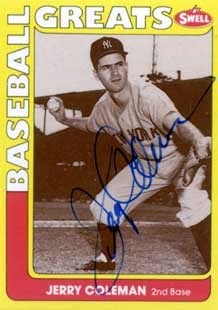 By the end of his career, he amassed four World Series rings as a member of the Yankees. Coleman’s baseball career was interrupted twice for both World War II and the Korean War. He spent three years in the Marines during World War II, amassing 57 missions as a dive bomber pilot. He was later recalled to active service during the Korean War, flying an additional 63 missions. His military service is an experience he revered above all of his baseball accomplishments. He spoke frequently of his military service, with the hopes of keeping the flame alive for those who perished. Below is an hour-long interview of Coleman with the San Diego Air and Space Museum.